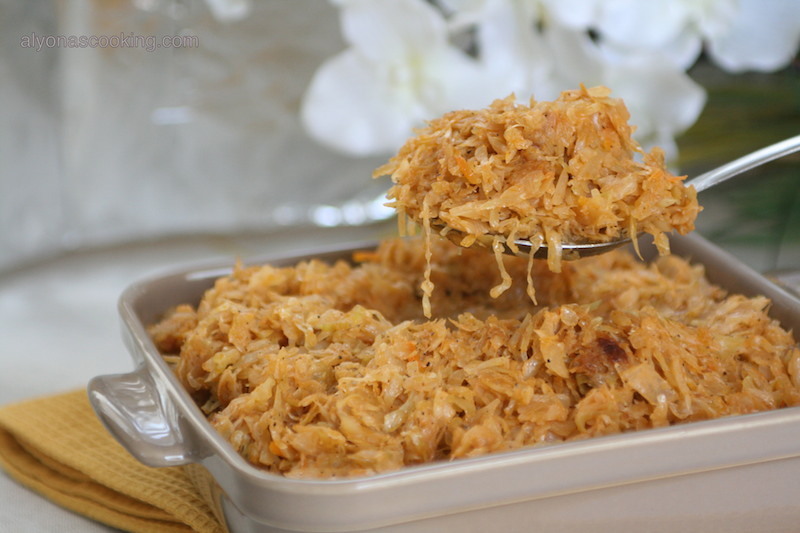 It’s very typical to find braised cabbage among the Slavic culture. 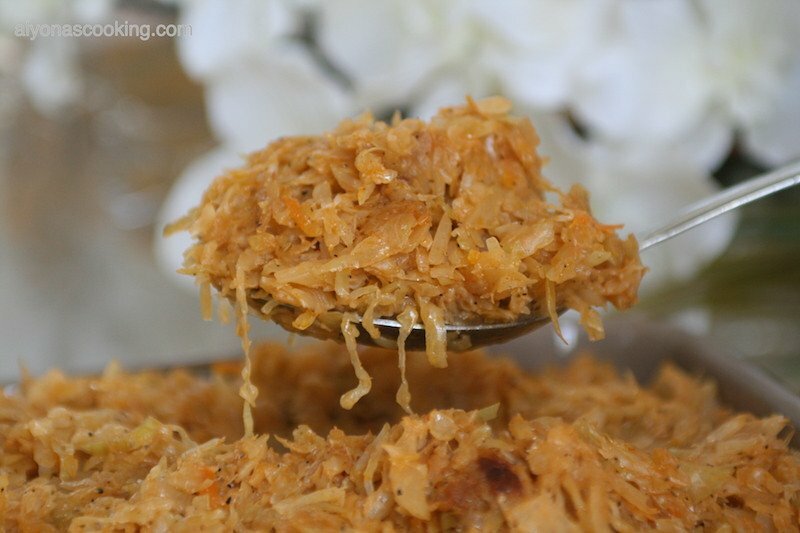 Braised cabbage usually consists of some fresh shredded cabbage and some sour kraut to create a sweet and savory cabbage blend that is caramelized from the slow cooking technique (also known as braised). It could be used in various ways: as a satisfying side, a filling for fried doughs, a tasty spread or even alone as it is. 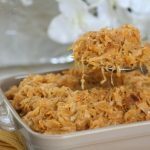 I don’t think I looked for another braised cabbage recipe ever since my mom shared this version with me. I find this cooking method to be very simple and a one pot kind of meal without extra dishes and pots and not only that but it tastes delicious! Give this one a try, I’m sure it won’t disappoint. 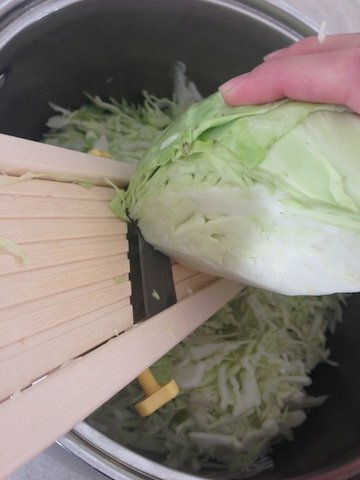 Cut cabbage in half lengthwise with core intact and shred finely into a large pot (preferably a nonstick pot). I used a Japanese mandolin for shredding or you can shred finely by hand. 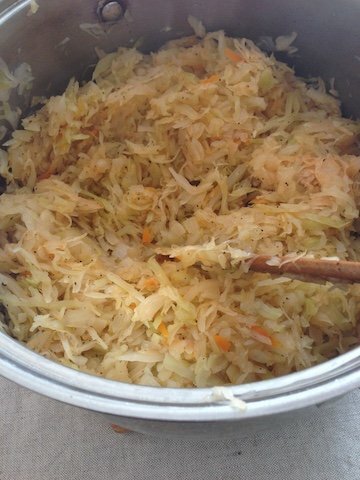 Don’t hesitate if there seems to be a lot of cabbage; it will reduce much in quantity during the cooking process. Place pot on stove and turn heat to med-high. Once you hear the cabbage slightly sizzling add 1 cup of water; cover with lid slightly tilted for steam to escape. Allow to cook for about 15-20 min stirring every 5 minutes or so until water has almost evaporated. 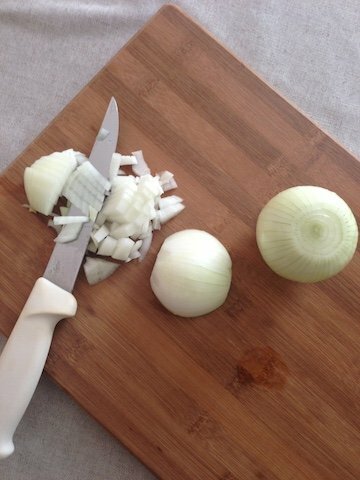 Meanwhile finely dice two onions. When water has almost evaporated (you can adjust heat to high for a few minutes for water to evaporate quicker) add 5 tbsp of oil to the cabbage; stir throughly. Then add 3 cups of sour kraut, 2 teaspoons of salt, 1 tsp of ground black pepper, 2 tbsp vinegar, 1 1/2 tbsp sugar and 5 tbsp of ketchup. Stir all ingredients together and reduce heat to med-low. 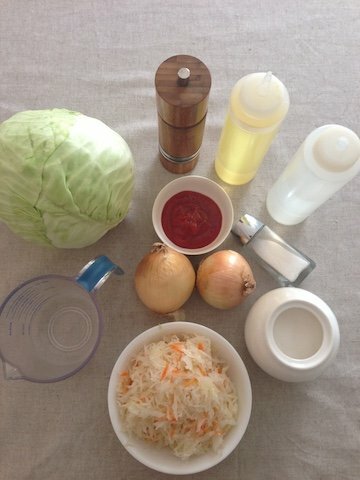 Allow cabbage to cook on med-low heat for 1 hour and 30 minutes, stirring every 10-15 minutes adding oil when needed. (I ended up adding about 8 tbsp of oil throughout the rest of the cooking period) Feel free to add more salt and pepper if needed. Cabbage looks light during the first stage of cooking but as it continues to cook on low heat it will get darker in color and caramelize. Cut cabbage lengthwise in half with core intact. Finely shred cabbage into a large pot (preferably a non stick pot). Place pot on a stove and turn stove on to medium-high heat. When you start to hear the cabbage slightly sizzling add 1 cup of water and cover with lid slightly tilted for steam to escape. Cook the cabbage in water for 15 -20 minutes until water has almost evaporated. When water has reduced in size and is almost gone add 5 tbsp of oil and stir to combine. Then add diced onions, sour kraut, 2 teaspoons of salt, 1 teaspoon of black pepper, 2 tbsp vinegar, 1 1/2 tbsp sugar, and 5 tbsp of ketchup. Reduce heat to med-low and continuing cooking on low heat for about an hour and a half, stirring every 10-15 minutes. Cabbage should have darkened in color by the end of the cooking time. Hi, Jessica you would add it in along with the ketchup.